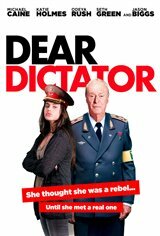 High school student Tatiana (Odeya Rush) admires Communist dictator Anton Vincent (Michael Caine), despite his obvious faults, including the fact that he murders innocent people. She even begins a correspondence with him, in which he tells her about his struggles, including most importantly, a rebel faction that wants to behead him and the fact that he can't trust anyone, while she complains about her mother (Katie Holmes), who is having an affair with her boss. Also, the mean girls who rule her high school and call themselves "Slushies" and the guy she has a crush on, whom she describes as a "Jesus Freak." When Anton Vincent is ousted, he goes missing, but turns up at Tatiana's house, where he seeks refuge. She gets him to disguise himself by shaving off his beard and dressing in casual clothing. When her mother discovers Anton in Tatiana's closet, the girl vows he's completely harmless. Meanwhile, Anton teaches Tatiana how to be a rebel and get back at the mean girls at school.